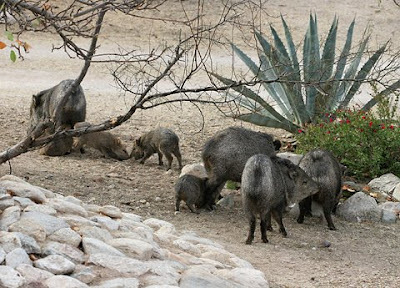 Peccaries are medium-sized animals found in the Americas. They have a strong, superficial resemblance to pigs. Like pigs, they have a snout ending in a cartilagenous disc, and eyes that are small relative to their head. Also like pigs, they use only the middle two digits for walking, although, unlike pigs, the other toes may be altogether absent. Their stomach is non-ruminating, although it has three chambers, and is more complex than that of pigs. Click here to listen to the interview with Melbourne Zoo Keeper, Curtis Prouting.